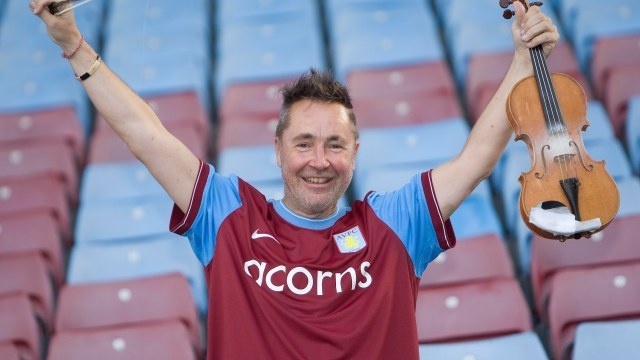 We are pleased to announce Nigel Kennedy as the latest AVST patron! Nigel Kennedy is a world renowned violinist. He made his early career in the classical field, and has more recently performed jazz, klezmer, and other music genres. Nigel’s recording of Vivaldi’s The Four Seasons with the English Chamber Orchestra in 1989 sold over 3 million copies and earned a place as one of the best-selling classical recordings ever and the album remained at the top of the UK classical charts for over a year. Although Nigel was born in Brighton, he is amongst an ever-increasing list of famous Villa supporters and shares his time between homes in Malvern, London and Kraków, Poland. At one music festival in Poland in 2010, he had his orchestra wear Villa shirts, while directing the crowd in the team’s chants. I am very excited about becoming involved in the Aston Villa Supporters Trust. I think that the fans have been pushed to one side by the administration of AVFC and the appointment of McLeish and Houllier demonstrates that; 2 appointments which were insensitive to put it mildly. It is high time that Villa fans had a voice and I would be honored to do anything I can do to help achieve that. Nigel joins Lord King, Benjamin Zephaniah, Jonny Gould, Shaun Teale and Ian Taylor as patrons of AVST. Welcome Nigel!